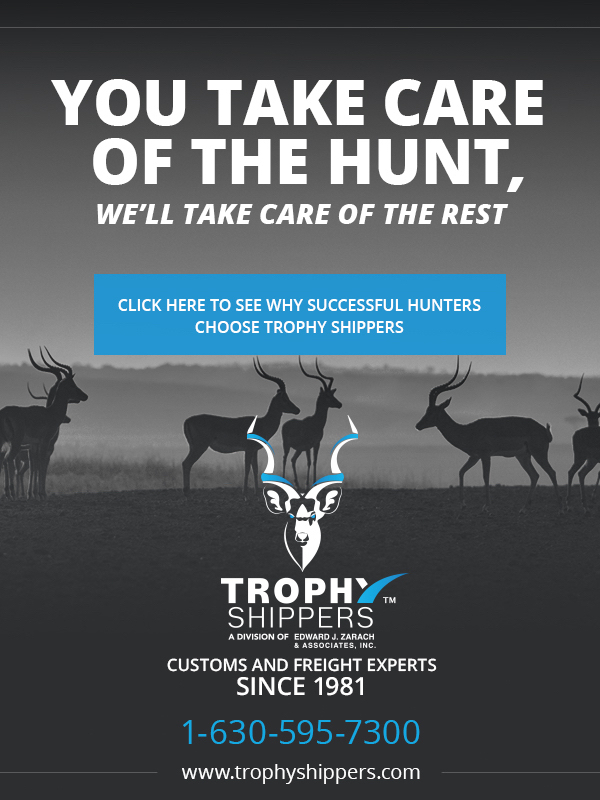 Why You Should Use A Hunting Trophy Shipping & Importation Specialist! Discussion in 'Safari Planning Guide' started by AfricaHunting.com, Nov 14, 2018. In a nutshell the answer is because your hunting trophies are too valuable! Of course they hold a monetary value, but more than that, they hold a sentimental value. Your hunting trophies are a representation of the success of your entire hunt, the experiences that you had and the memories that you made. For these reasons it is well worth hiring someone who specializes in the intricacies of trophy importation to take care of them for you. Over the course of the years, when it comes to stories of negative experiences that I have heard from hunters, by far more issues arise from hunting trophy shipping and importation. The challenges of getting all of the paperwork details in order and getting hunting trophies back home is more challenging than the hunt. Today more than ever before you have to dot your i's and cross your t's, (and hope everyone else involved in the process has too). It is daunting even for me to keep up with all the different laws and changing regulations and requirements in the many countries from where you hunt to where you live. I have long believed that it is well worth your while to hire experts to help you navigate this process. Not only will you save yourself a lot of time, hassle and stress but more importantly you will avoid the MANY obstacles, compliance issues and complications that you can encounter during the process of importing your hunting trophies. And most importantly you will reduce the risk that your trophies may be delayed, lost or confiscated. As any of you who have spent any time on here well know I strive to make AfricaHunting.com the best hunting site and resource for hunting in Africa and abroad. I want all of you to have access to the very best people and companies to work with, as well as reliable information and advice from those who really know what they are talking about. For this reason I am happy to announce that Tom Kelly from TROPHY SHIPPERS (www.trophyshippers.com) along with their team have joined AH as our recommended hunting trophy shipping and importation specialist. Hi all, do they ship to the UK if not any recommendations who does, I’ve used different people before but nice to know if there are specialists for the job, would make me sleep better knowing they are in safe hands!! We can certainly ship to the UK! We can handle shipping needs to anywhere in the world. I will send you a PM to get some more info on your shipment. TROPHY SHIPPERS - You enjoy your hunt, we'll get your trophies home! Do they ship to Canada and what city as port of entry?